Impy: So basically this record is about getting crabs? He’s mentioned them three times already. Is this Sgt. Pepper’s derivative? Mrowster: Yeah, same year or thereabouts. It’s a satire. A lampoon. A political cartoon of a record. I never read those cartoons. I’d rather read Andy Capp. Have you ever met a funny Zappa fan? I: They’re always overly-intellectual eggheads. Was that a Beatles’ reference? I think that one was referencing “When I’m 64”. M: There’s like 15 people playing on this record, but it’s all about Frank. You can see him, smell him everywhere. I don’t believe people into heavy drugs were into this. Sure, maybe people smoked pot and giggled to it, but dropping acid to this? No way. I: So all I know about Triples is the water goes through the mash tun three times, and that it’s strong. And Belgian. I have no idea if this is authentic to the style. I mean, it’s orange. Kinda sour. photo by Dr000 on flickr, creative commons license. M: My stomach itches. That song “Hot Poop” was more like a lifeless turd. I: There’s a lively carbonation. Kind of a dog-food nose, but I’m not making up my mind yet. Cumquats, or apricots. Suddenly, I wish it was colder so it would taste less. M: Ooh – wow – It’s kind of like that taste in your mouth when you wake up in the morning. Zappa was always going on about how he was “influenced by Stockhausen”. M: Just like this modern composition guy. This record is not beautiful or even emotionally complex. I: It’s munchkin rock. Do you think we should have aged it? M: The record is already 40 years old, I don’t think it’s gonna ever sound any better. I: I can’t get past the smell. M: It’s really tough going. 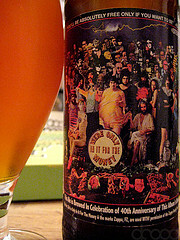 Is there anything about this beer that speaks of Zappa? I: The colour – I mean, it’s bright orange. It looks like Fanta or something. M: I don’t know if we can even get through it: 1 pt., 6 oz. and a double album. I: Wait – it’s a double album? M: [checks the stream] Sorry, false alarm. It’s only one album. I: I wish we were listening DIGITAL UNDERGROUND instead. Their “No Nose Job” beats this “What’s the Ugliest Part of Your Body?” song in every way. Was that a Jesus Christ Superstar reference I just heard? M: This predates Jesus Christ Superstar. If this is Zappa’s crowning achievement . . . my god. This is completely not what I was expecting from the beer or the man. Man. I: Did you get the fish note just then? M: The fish-juice note! Clearly Zappa put a lot of time into this. I: I guess, but it seems pretty arbitrary to me. M: I’m just saying there’s a lot going on on this record. It’s just not pleasurable to go into, nor is this beer. Oh man. I: Did you just get the fish note again? M: I got the fish note again. Is there anything good we can say about this? I’ve tried to say it’s complex. I: All I can think about is how he got from this to “Valley Girl”. Should we write the post now? M: We’ve got to finish the beer first. At least it’s getting easier because of the alcohol content. I: The beer leaves a kind of nice flavor on my lips. Like Sweet Tarts. M: You always hope there’s some hidden beauty in Zappa, because everyone says it’s great. I: Dweezil is kind of cute. Zappa made him. I saw him on Letterman once. Ok, I don’t know if I can finish this. M: We can change to another Zappa record. But wait, I don’t have another Zappa record. I have some Beefheart though . . .